Final 3 competitors are finally unmasked! It was the new singing competition that definitely turned some heads and stumped viewers all across America; the Masked Singer on Fox. The moment has finally arrived that drove fans berserk. The final three masked singers who remained in the competition were finally unmasked and one of them was bestowed the winner of the Masked Singer. For those who are not familiar to the format of the show, here is a brief synopsis. The show/competition began with twelve celebrities dressed head to toe in elaborate costumes, hiding their true identities. Even their voices were altered with special effects to keep their identities a secret! The only time viewers heard the celebrity’s real voice was when they took the stage to sing their hearts out and do all they can to remain in the competition. During each episode, a portion of the competitors are paired off into face-off competitions, in which each will perform a song of his or her choice. From each face-off, the panelists and live audience vote; the winner is safe for the week, while the loser is put up for elimination. At the end of the episode, the losers of the face-offs are then subjected to the earlier votes of the panelists to determine who will not continue; the eliminated singer then takes off their mask to reveal their identity. In addition to the singing competition, hints to each masked singer’s identity are offered during the show. The panelists are given time to speculate the identity of the singer after the performance and ask them a single question to try to determine their identity. The competitors in the first season were said to have a combined 65 Grammy nominations, 16 multi-Platinum albums, 16 Emmy nominations, 9 Broadway shows, 4 Super Bowl titles, and 4 stars on the Hollywood Walk of Fame. On February 27, 2019, the finale of the show finally aired. All bets were in on who was hiding behind the mask. The final three competitors were the Bee, the Peacock, and the Monster. For weeks, these masked singers were tricking, impressing, and stumping viewers in attendance and watching at home, the host, Nick Cannon, and the panel of judges. The judging panel consisted of singer-songwriter Robin Thicke, television personality Jenny McCarthy, actor/comedian Ken Jeong, and recording artist Nicole Scherzinger. The final three singers took the stage in a winner-take-all battle for the trophy and title of the Masked Singer. First up to the microphone was the Peacock. He sang “Shake a Tail Feather” by Ray Charles. He traipsed through the audience with a cadre of backup dancers in tow. As he has done throughout the season, the Peacock gave another excellent, crowd-pleasing performance. Even with all of the clues that were given within the nine weeks of competition, the judges and viewers continued to scratch their heads and figure out who really is the Peacock. Next up on stage was the Bee. The intriguing insect quieted things down a bit that night with a soulful, simple yet elegant rendition of Bonnie Raitt’s “I Can’t Make You Love Me.” From all the clues, we know the Bee has been working since the 1950s, she has had 22 Grammy nominations, has won 10 Grammys and other awards, and is known as an empress. Guest judge on the panel that night was Kenan Thompson who directly stated “That Bee is Gladys Knight, I concur.” People were still unsure about the Bee’s real identity. Last but not least on stage was the Monster. He once again proved his versatility by singing “This Is How We Do It” by Montell Jordan. The Monster, by far, was probably one of the toughest identities to guess. Week after week, he kept changing things up and confusing the judges and viewers. 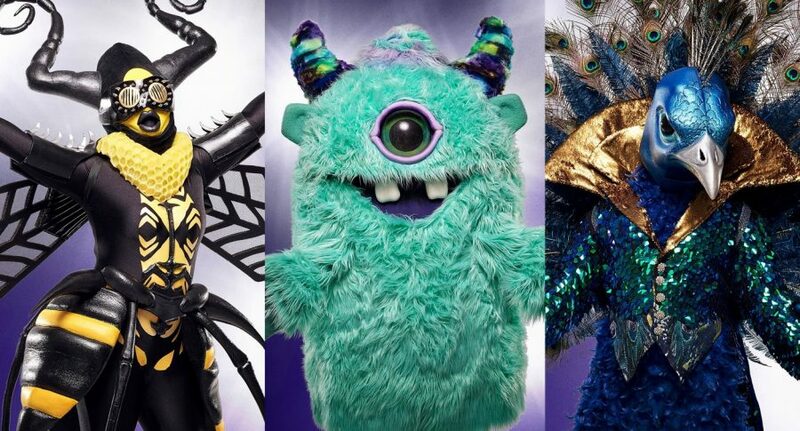 While singing during the finale, Thompson pointed out the Monster’s fancy footwork and referred to his costume as a “furry trashcan.” Even after all the clues given, no one could seem to figure out who was behind the mask of the Monster. As the 2-hour finale began to wrap up, host Nick Cannon announced who came in third place. To a large shock, the Bee came in third place. After the judges locked in their final guesses, the Bee removed her mask. Lo and behold, it was the Empress of Soul, Gladys Knight! In second place was the Peacock. Upon removal of his mask, all-around entertainer Donny Osmond was hiding behind it! That obviously meant the Monster was the winner of the Masked Singer. Everyone was eager to see who he really was. Removing his mask, it was revealed that T-Pain was the Monster! Viewers went insane after finding out who the final three competitors were. Even more excitement was added at the end of the show because an announcement about a second season was announced. The Masked Singer is very exciting and is definitely not one of your typical singing competitions. Everyone is definitely looking forward to the next season.